Katy Perry’s “Who Am I Living For?” – Occult Initiation or Religious Song ? Is it a song about occult initiation? Some might interpret the song as a religious song, perhaps about Christianity. But the terminology used however strongly points to occult mysteries: reference to a phoenix (a metaphor of man’s spiritual rebirth), a sacrifice, light growing from inside (illumination), duality between heaven and hell, etc. What do you think? “Black Swan” is an intense psychological thriller describing a ballet dancer’s metamorphosis into the “Black Swan”. Behind the movie’s freaky facade lies a profound commentary on the cost of fame, the sacrifice of artists and the hidden forces behind the shady world of high-stakes entertainment. We will look at the occult symbolism of the movie and its themes relating to the dark side of show business. Directed by Darren Aronofsky, Black Swan follows shy ballet dancer Nina along her path to success in the demanding world of professional ballet. Black Swan can be considered a companion piece to the director’s previous movie, The Wrestler, which also describes the ups and downs of a troubled person working in a lesser-known field in the performing arts: professional wrestling. Although both movies explore similar themes (i.e. sacrificing one’s self for the good of the performance), the world in which Nina evolves and the obstacles she must endure are diametrically opposed to those of The Wrestler. Randy “The Ram” Robinson is a blue-collar guy living in a blue-collar town and must cope with the physical pain caused by his blue-collar lifestyle. Nina, on the other hand, performs in the refined world of ballet and her struggles are psychological, emotional and even spiritual. I often point out that great works of art can be interpreted in numerous ways, depending on the knowledge and experiences of each viewer. This movie is no exception … there are indeed numerous ways to interpret the plot of the movie. Through the use of meanings and symbols, however, the movie clearly alludes to many issues previously discussed on The Vigilant Citizen: the dark and occult side of fame, duality, trauma-based mind control, the forced creation of an alter persona and more. The main character, Nina, goes through a metaphysical change – by getting in touch with her “dark side” – in order to become a better performer. This change is imposed on Nina by her “handler”, in this case, her ballet director. The movie uses subtle references to trauma-based mind control to explain the creation of an independent alter-person in Nina’s psyche. Although Black Swan is fiction, it nevertheless explores hidden realities of high-stakes art and performance. There are numerous examples of artists who have embraced darker alter egos to take their art to “another level” … and many who ultimately are consumed by them. We will look at the occult and mind-control elements of Black Swan and see how they relate to some of the realities of the world of professional entertainment. A promotional poster for Black Swan. Nina (played by Natalie Portman) is shown with a crack through her face, representing the fracturing of her personality, an important concept and symbol of mind control. Nina’s bedroom. Notice the butterflies on the wall, a reference to Monarch programming. Next to the window is a big white rabbit, a symbol of mind control originating from Alice in Wonderland – a fairy tale used in the programming of MK slaves. By following the White Rabbit Alice is lead to an alternate world, Wonderland, which, in mind control terms, refers to a slave’s dissociative state. After her meeting with Thomas, Nina, dressed in white, crosses the path of another Nina, dressed in black. This symbolically represents the coming of Nina’s new, dark alter-ego. Nina hallucinates all kinds of strange mutations on her body. They represent the gradual coming out of the Black Swan in her. Nina at the end of her “perfect” performance as the Black Swan. She is briefly shown with black wings, symbolizing that she has become “one” with the Black Swan. Right before her big performance as the Black Swan, Nina fights against herself in her dressing room. During the fight between Nina and the Black Swan, a mirror breaks, representing the collapse of the psychological boundary separating both entities. By shattering the mirror, Nina becomes the Black Swan. Nina dying at the end of her performance. Her last words to Thomas: “I was perfect”. Lady Gaga “sacrificed” in her performance at the 2009 VMA’s. 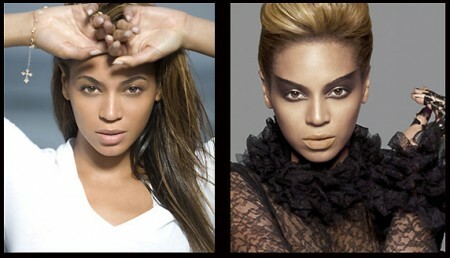 Beyonce and Sasha Fierce, a pop-music equivalent of the White and Black Swan. Examples of actors dying in mysterious circumstances after playing the role of a devilish and twisted characters. 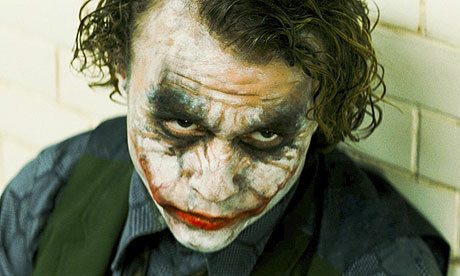 People close to Ledger claim his role as the Joker caused his demise. 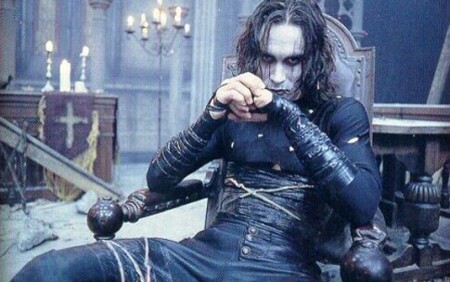 Brandon Lee mysteriously died DURING the filming of The Crow. 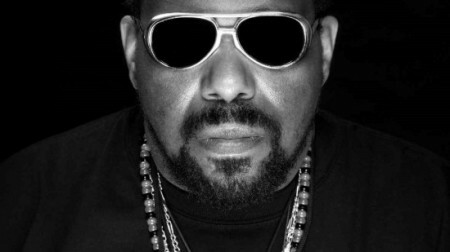 The official story of his death is still widely disputed. The scene during which he died was highly symbolic. Black Swan is a profound movie that can be interpreted on many levels. We looked at the occult and mind-control elements of the movie and examined its messages on the shady world of show business. The movie’s commentary on the entertainment world’s marriage with occult forces is something that has been discussed numerous times on the Vigilant Citizen. Although the concept is rarely discussed or even noticed by the average person, insiders in the entertainment world often attest to strange forces of varying kinds at work in the industry. Through Nina’s metamorphosis from a shy nobody to a possessed superstar, the viewers experience the dark side of entertainment. Mind control, manipulation and immorality collide with success and recognition. Dark impulses, addictions and self-destruction arise with artistic genius and creative brilliance. Those who are “running the show” know how to bring the Black Swan out of up-and-coming artists … and they know very well it will destroy them in the long run. And they are OK with that. The same way Beth was pushed aside to welcome a new Swan Queen, the public will always welcome the elite’s newest star with applause and acclaim. Because, as they say, the show must go on. P.S: Some images & parts of the movie are not discussed in this post due to their obscenity. In US, a bill giving the president an Internet “kill switch” during times of emergency that failed to pass Congress last year will return this year, but with a revision that has many civil liberties advocates concerned: It will give the president the ability to shut down parts of the Internet without any court oversight. Moreover, Egypt’s government shut down major internet traffic during these recent protests. Our governments will be stealing Internet from us too, beware !